Evanston police examine the car hit by a stray bullet in the 300 block of Custer Avenue. Two men were later arrested in connection with shots fired calls. Police arrested two people Wednesday in connection with multiple reports of shots fired in south Evanston, officials said. 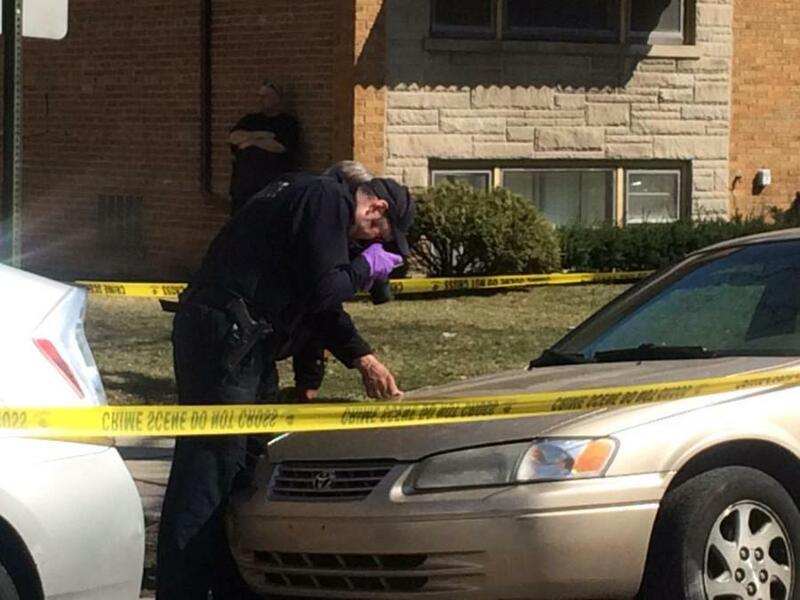 A stray bullet hit an unoccupied car in the 300 block of Custer Avenue, Evanston police Cmdr. Joseph Dugan said. No one was reported injured. Police received many calls from residents early Wednesday afternoon that shots had been fired on Custer Avenue, Dugan said. One caller provided a description of a car seen leaving the area, he said. Officers responded and located the car, Dugan said. After police tried to stop the car in an alley in the 600 block of Oakton Street, the car’s two occupants fled on foot, officials said. One of the occupants was caught in the 400 block of Callan Avenue, police said. Officers found the second person hiding in the 600 block of Hull Terrace, Dugan said. Police were clearing the area around the scene of the shooting Wednesday afternoon, according to a tweet from the Evanston Police Department’s account at about 1 p.m.
Dugan said police recovered two handguns.